Sharyl Snider was named 2018 March Member of the Month by the Women In Trucking Association. Sharyl is ranked No. 1 female driver of Elkhart, IN-based CWRV Transport. 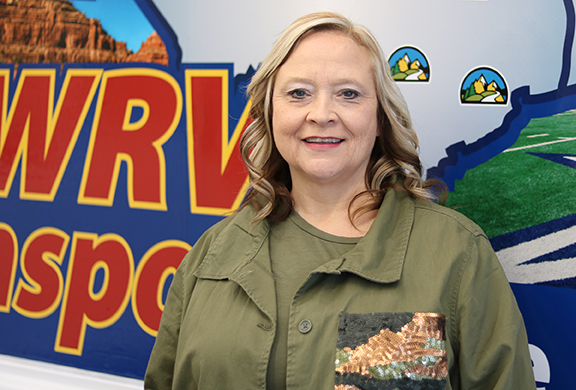 Signing up with Camping World’s exclusive RV transporter in 2013, she has shone brightly, safety- and performance-wise, in an otherwise male-dominated business. Sharyl was born and raised in South Bend, Indiana. In June 1982, she married the love of her life, Ernie, then a member of a contractors union and holder of a Class A CDL. Together they built and savored a blissful and comfortable life, raising a family of two children that later included four grandchildren. By 2002, Sharyl had been working at various RV manufacturing facilities for a total of 12 years. Realizing that she was going nowhere, she and her husband decided to work for a friend engaged in the RV delivery business. For starters, Ernie coaxed her to try delivering campers with him. Soon afterwards, he bought her a truck; and since 2013 when she made her first RV delivery, she has been driving straight, safe and strong. “At first, it was a little intimidating as I had never hauled anything before. With zero experience in commercial driving, it was scary, to say the least. But with my husband’s patience and my fortitude, I began and successfully pursued what is now my life’s passion,” Sharyl relates. She now considers herself a pro, thanks to Ernie, who patiently guided her through the rudiments of RV delivery, such as logging trips, getting through weigh stations, among others tasks. Looking back, Sharyl recalls with pride the experience of delivering FEMA units for victims of hurricanes Rita and Katrina. Witnessing the resulting devastation, she was grateful for the chance to help provide housing for those left homeless by these catastrophes. Several years into their RV delivery work, Sharyl’s husband decided to return to his union construction work, compelling her to take units on her own. It’s a move that certainly paid off, taking her to all 48 states and almost all territories in Canada. “I even took my truck and a camper numerous times to Vancouver Island and Newfoundland by boat. Except for getting sea sick, the whole experience was so exciting. I would never have seen all the wonderful places I have been if I didn’t do this type of work. And for that, I feel very blessed,” she enthuses. Sharyl’s life, however, took an unfortunate turn when in December 2016 her husband perished in a motor vehicle accident. “My life has since changed dramatically. I stay pretty close to home now and usually take runs that get me home every night. But my passion for delivering campers remains. It’s what keeps me going,” she says. CWRV’s top female driver commends the company and its employees for their excellent work ethic. “I know I’m an independent contractor, this is my own business, and I am my own boss. However, it is the steadfast support that CWRV provides behind the scenes that keeps me going. I really believe we need more women in this sector, and CWRV is a great place to begin such a business that offers such great opportunities,” she concludes.